Winners Return Now On Sale! January 15-25 only! Tix start at $15. 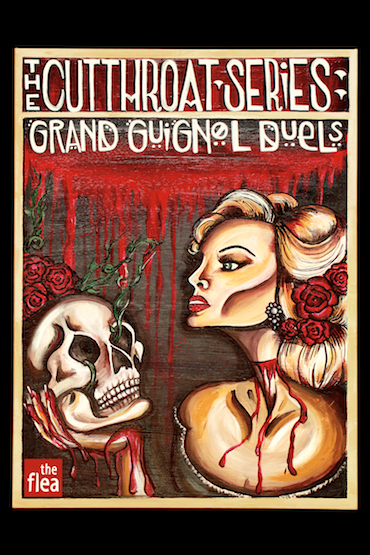 The Flea Theater has completed the most terrifying 4 part theatrical event of the fall – THECUTTHROAT SERIES: GRAND GUIGNOLDUELS. Each audience voted on their favorite play of the 4 pods (Gore, Cruelty, Night Terror, and Lust), and 4 plays are returning for a limited run this January 15-25. These turn of the century French plays alternate between ghastly horrors and carnal comedies to create a gripping, deplorable evening of theater. Featuring Sean Devare, Katarina Feder, Shane Hall, Olivia Jampol, Artem Kreimer, William Serri, and Alexander Kushi-Willis. This ménage à trois comedy brings three couples together for a dinner party in the country. A wet appetite needs a good fork. Featuring Ryan Stinnett, Jimmy Dailey, Matt Cox, Jack Gilbert, Edan Jacob Levy, Cristina Pitter, Julia Anrather, Ricardy Fabre, William Serri, and Artem Kreimer. Two reporters visit an insane asylum to learn of its unique methods. Upon arrival they quickly realize that the system isn’t what it seems. A man’s curiosity threatens to destroy his family. Can he ignore the secrets of those he loves, or will his fear of not knowing consume him? Greed and lust for power – a tyrant’s vices bring him to his knees.